For a change, the evening had a clear sky. That brought in a sizeable audience for the Mangalai Isai at Sivagami Pethachi Auditorium inside M.CT.M. school on Luz Church Road. 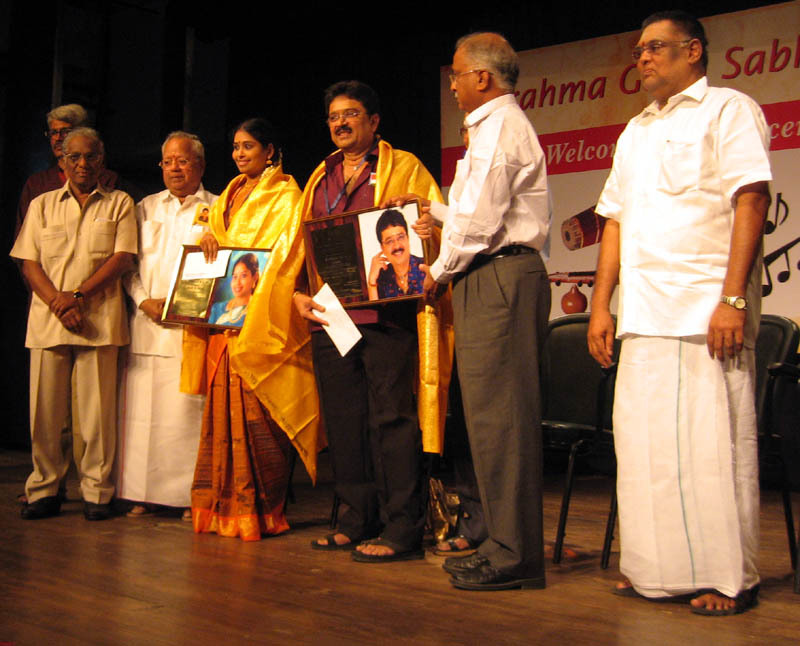 A quick and well timed felicitations marked the evening.Carnatic vocalist Nithyasree Mahadevan received the title Gaana Padmam and S.Ve.Shekher received 'Nataka Padmam'. 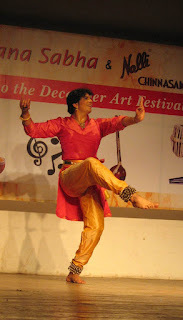 The Natya Padman will be conferred on senior dancer Vyjayantimala Bali later, as she is travelling,announced the sabha. The president of the sabha Nalli Kuppusamy Chetti, Doordarshan A.Natarajan shared memories of Nithyasree and her family. 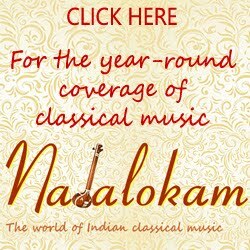 While Nalli chettiyar remembered that Nithyasree shares birthday with his daughter, Natarajan attributed 50% of Nithyasree's achievements to Mahadevan, her husband. The chief guest K. Jayarama Krishnan, vice-president, Tata Consultancy Services spoke on the relationship between two ITs - Information Technology and Indian Tradition and that his company is encouraging the college students to perform fine arts. Nithyasree announced the institution of an award in the name of D.K. Pattammal and expressed happiness that the sabha has chosen vidwan T.N.Seshagopalan to receive the honours this year. 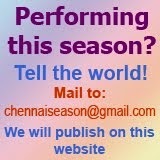 Nithyasree tried to be modest in her acceptance speech. She said, she feels shy of receiving such awards since there are many deserving and senior artistes out there. She concluded attributing 100% of whatever she has achieved to her husband! S.Ve. Shekher's speech evoked waves of laughter from the audience throughout. But he did not forget to remember his first act initiated by 'Radio Anna' Koothapiran and V.Gopalakrishnan who made his debut possible, but as a corpse! Shekher also announced that the award money will be used for purchasing laptop and desktop to deserving students who have earlier expressed the need to him. The drama fraternity came with shawls to Shekher and Shekher, on behalf of the drama artists presented a shawl to Nithyasree. December music festival guide prepared by S. Kannan sponsored by Nalli was also launched on the occasion. Following the felicitations, a Bharathanatyam performance by Aniruddha Knight, the grandson of yesteryear Bharathanatyam exponent Bala Saraswathy was presented. Aniruddha was full of abhinaya and his authoritative presence on stage with bright coloured attire was a a treat to the eyes.